Co-evolution of viruses with their hosts has led to a highly complex and powerful immune system for discrimination of self- and non-self, or harmless and dangerous on the one hand, and elaborate mechanisms regulating recognition and immune responses, on the other. RNA viruses are sensed predominantly by RNA pattern recognition receptors like RIG-I and TLRs. We are studying the exact nature of the RNA PAMPs of rhabdo- and paramyxoviruses (Runge et al., 2014), how their recognition is prevented, e.g. 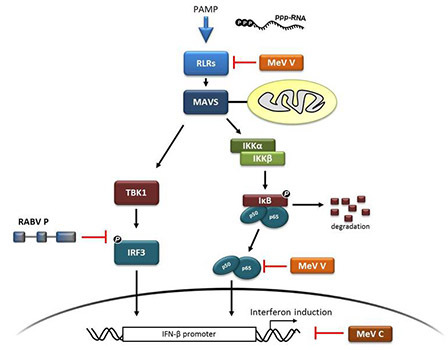 by shielding the viral RNA in an RNP complex, and how the immune response is downregulated by viral proteins. Particularly early cytokines such as type I and III interferons (IFNs), which integrate innate and adaptive immune responses, are essential targets for viruses.